Savvy brands know their consumers are on Facebook and on the go. Now they can engage them with immersive, relevant ad experiences beyond flat images and simple text. 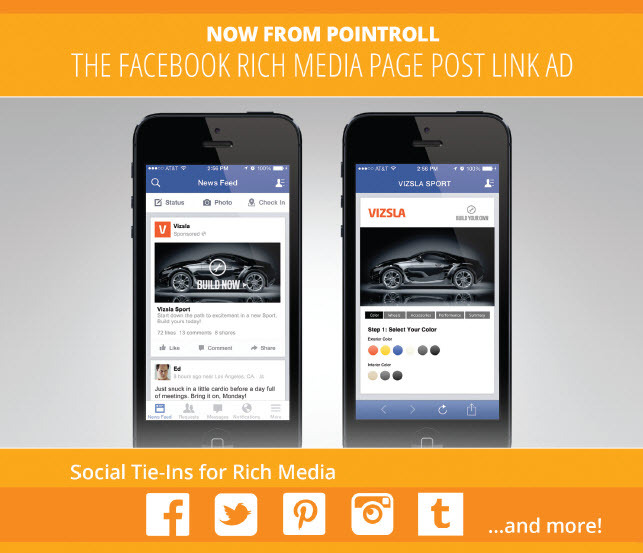 Introducing the Rich Media Page Post Link Ad powered by PointRoll. This new format allows big brands to leverage all of their multiscreen digital campaign assets through Facebook's mobile news feed. This native ad format creates an experience as interactive as Facebook itself, delivering value for brands while enhancing the user experience. PointRoll also offers packages that combine social media with Web, mobile and video campaigns. PointRoll also powers custom-branded Facebook advertising apps. More than initiating a social dialogue, these highly engaging ad-based apps maintain a long-format relationship between brands and consumers, leveraging both paid and earned media. Working with a leading CPG brand, PointRoll created a Rich Media Page Post Link Ad campaign that dramatically outperformed the brand's previous rich media campaigns. The combination of premium placement on Facebook and the interactive ad resulted in a 39% lift in interaction rate of the Facebook Rich Media unit vs. traditional rich media on mobile and more than 30 seconds of time spent with the Rich Media Page Post Link Ad on mobile. 20,704 new brand page "likes"
1Actions: The number of actions taken on your ad, page, app or event after someone saw your ad, even if they didn't click on it. Actions include page "likes," app installs, conversions, event responses, etc. For example, if you get two page "likes" and two comments, they will be counted as four actions.